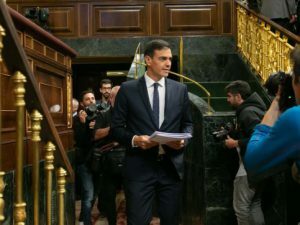 Prime Minister Pedro Sánchez announced the political measure on Wednesday, a day after the high court judges decided by a slim majority to overturn a series of rulings that would have tipped the scales in favor of customers. ‘Never again will Spanish citizens have to pay [the mortgages tax], banks will do it,’ said Sánchez, with regards the royal decree to be passed by his government. He also ‘regretted’ the Supreme Court’s ruling and said that the decision was ‘neither positive for banks nor citizens’. The justice system faced severe criticism from political leaders after the u-turn, and some even demanded the resignation of Carlos Lesmes, the president of Spain’s General Council of the Judiciary. ‘We accept the criticism, but this situation was caused by the law’s lack of clarity,’ said Lesmes. Sánchez contradicted Lesmes regarding the clarity of the law, but did not clarify whether he would force his resignation before the judiciary official’s term in office ends in the coming weeks. The Spanish Prime Minister also announced the creation of an independent authority to guarantee the rights of customers in the financial sector. The extraordinary session was called after the Supreme Court reversed its own decisions. In February, the Supreme Court said clients, not banks, should pay the duty. On 18 October, it ruled that it was the lender or bank, that must pay it. A day after, the very same judges unprecedentedly hesitated, and put on hold the decision. The 28 judges of the Supreme Court debated for two days on. And they decided against favouring the clients by a slim majority: 15 voted for citizens to pay, while 13 said banks should be the ones taking on the duty. Spanish banks rose in the stock markets on Wednesday, with Banco Santander growing by 3.7%, BBVA by 3%, CaixaBank by 5.3%, and Banc Sabadell by 5.7%.